It's been four long years since we've seen superspy James Bond on the big screen, but his newest outing, Skyfall, is already the most succesful Bond film of all time. The movie has certainly been well represented here at FS.net, with Alex raving about it himself, interviewing the producers, director Sam Mendes, and even Ben Whishaw (the new Q) while Jeremy gave it top marks for Bond accuracy. But could the 00 agent with a license to kill have borrowed a few tricks from a classic 1990 holiday film for its action-packed third act, or was that sequence a shout-out to a Sam Peckinpah classic? And does it even matter? Discuss below! The third act of Skyfall is not only full of great action, it also answers an important question that have had fans wondering for years if the name "James Bond" is actually a codename itself, sets up the nostalgia of exploring Bond's past, and then immediately shakes the foundations of everything he knows and loves by destroying his beloved Aston Martin DB5 and killing Judi Dench's M. (Did you see his face when that car exploded? Dude was pissed.) Following the death of Vesper Lynd in Casino Royale and the wallowing that took place in Quantum of Solace, it was great to see Bond ditch that emotional baggage in Skyfall, trading feelings of romance for his professional respect and different kind of love for M in the process. Before M's passing, Bond teams with the aging MI6 leader and the "Skyfall" groundskeeper Kincade (played by Albert Finney) to defend his family's estate against an attack from Silva (Javier Bardem) and his gang of thugs. The good guys booby trap the house, planting shotgun shells under floorboards, filling glass bulbs with nails and sharp objects and hooking them to light fixtures, and generally cause confusion and disarray as they shoot up most of the bad guys attempting to infiltrate the estate. After the film, movie lovers took to the internet to discuss the film in-depth, and a lot of people referred to that third act with some variation of the description that it was "Bond meets Home Alone," referring to Chris Columbus' 1990 movie in which Macaulay Culkin plays a character who is left alone during the holidays, defending his house from two burglars by setting up elaborate traps on his home turf. Tim Stack of Entertainment Weekly even wrote a piece making this exact comparison this past weekend. @infamouskidd Calling it a HOME ALONE third act should disqualify you from ever being taken seriously as a critic. "It is a facile, ignorant comparison. Skyfall ends with a siege that requires an outgunned and outnumbered Bond to repel invaders via the use of improvised weaponry and traps. Pick ten westerns at random, and you're likely to find one that ends with a handful of good guys - low on ammo, relying on ingenuity - defending the homestead from a legion of bad guys. 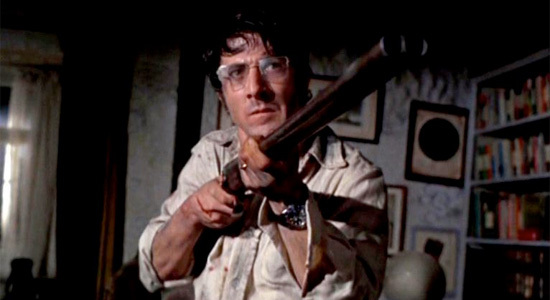 But the obvious point of reference - frankly, the only point of reference - for Skyfall's finale is Sam Peckinpah's Straw Dogs. Geographically (U.K.) and practically (the traps are crude and lethal), it's the only comparison that makes sense. I suppose you might consider Home Alone at some point, but for that to be your first point of reference reveals a gaping hole in your film education. Fine for a casual audience member, inexcusable for a film critic. It'd be like accusing a horror film with a shower kill of ripping off Vacation." Seeing references to act three of "Skyfall" as "Home Alone with James Bond" has convinced me no one under 30 knows "Straw Dogs." McWeeny and Smith are both writers for whom I have a tremendous amount of respect, but I think the issue comes down to cinematic reference points. Yes, a lot of younger reviewers need to expand their cultural horizons and venture back to see films made before the 1980s. But even film critics (or paid movie bloggers, or whatever they'd like to be called) don't have an encyclopedic knowledge of every movie ever made, and since we all grew up with different backgrounds and went through different walks of life, even if we've seen a lot of the same movies, the age at which we see them can sometimes give a film more impact than another. Sam Peckinpah's 1971 psychological thriller is a slow burn, unhinged, often-disturbing study of what it means to be a man. Chris Columbus' film is a family friendly holiday movie that made a lasting impression on a lot of younger writers during their childhoods. Is it so far-fetched a younger generation would recall Kevin McCallister's hijinks over those of Dustin Hoffman's David Sumner as he fends off attackers from his English cottage? Just because someone makes a comparison to Home Alone doesn't mean they haven't seen Straw Dogs, only perhaps that the former movie made more of an impact at the time of watching. I've seen Straw Dogs, but I'll sheepishly admit that Home Alone was the first film to come to mind when I was sitting in the theater watching Bond and M lay those traps in the house. Though I didn't make that specific comparison in my own review, I don't think every other point I made should be tossed to the side if I did. The democratization of film criticism (or discussion) has made it so anyone of any age with an internet connection can share their thoughts on any movie, and while I agree that people who purport to be critics should definitely educate themselves to make their writing better, sometimes there are movies that simply slip through our mind's cracks. Cinematographer Roger Deakins told Hollywood.com that he and Mendes discussed shooting Skyfall as "if it were a John Ford or Sam Peckinpah film", which will likely be seen as confirmation by those who don't appreciate the Home Alone comparison that they're justified in their decision. But what if you didn't read that interview and thought that Skyfall's third act was referencing Carpenter's Assault on Precinct 13, Kurosawa's Seven Samurai, or any number of other classic siege movies? Even Smith in his response above, admits that you these tropes often appear in older westerns. If you chose one of those as a basis for comparison, would you be just as wrong as someone who compared Skyfall to a 90s family film? Maybe. He makes some good points (especially pointing out the geographical similarity in the two films), but I still don't think there has to be a "right" choice when it comes to comparing movies. It's a subjective medium, and sometimes one movie with certain tropes might come to mind faster than another. In this particular case, I think the whole Skyfall-Home Alone comparison comes from a simple case of finding a common ground with your peers when you're talking about movies. Many more children of the 80s have seen Home Alone than Straw Dogs, so it's simply easier to make that connection to get your point across. Speaking for myself only, it's not a matter of disrespecting classic films by not mentioning those in the conversation, it's just taking the easiest and most direct route to finding a cinematic reference point. It's shorthand for a younger generation. Should writers under the age of 30 seek out Peckinpah's filmography to educate themselves? Absolutely, and that includes myself (I've already seen Straw Dogs and The Wild Bunch, but need to familiarize myself with the rest of his work). But does making a reference to a certain recent film, whether you've seen an older movie or not, automatically discount everything you have to say? I don't necessarily think so. Sound off in the comments with your thoughts on this discussion below. For more on James Bond, check out the must-see documentary Everything or Nothing (available to watch free right here) and listen to the Golden Briefcase's Shaken Not Stirred episode in which Jacob S. Hall joins our own Tim Buel and Jeremy Kirk to discuss all things 007. For more from FS, check out this category. I'm under 30 and I've seen Straw Dogs what's with the ageism, Drew? I felt like the part where Bond falls into the Komodo dragon pit - that was Return of the Jedi where Luke falls into the Rancor pit with the pig-looking guard. I Think that is much an homage to the scene with Roger Moore and the Crocodiles in Live and et die (he also stands on one to get off the peril). And recent Bond movies love to do self references to the franchise. Every element of that short scene called for it. The dirt pit, bond falls in with a larger henchman(where in the Return of the Jedi it's a 'pig-man' henchman), the komodo dragon lurches out of the darkness. I think they like to create those moments that leave an opportunity floating for a bond-ism. The first thing to spring to your mind is the first thing to spring to your mind, period. When I saw Bond, dressed in a sweater/overcoat, holding a shot gun and dealing with a villainous assasin attacking an 'in the middle of nowwhere' country home with innocent bystanders in peril, my frame of reference was the Matt Damon/Clive Owen showdown in The Bourne Identity. I've seen both Straw Dogs and the first two Home Alone films, but my first thought was that Skyfall was playing an extended riff on a major set piece from Limon's franchise starter. Obviously Straw Dogs or even Home Alone is a more accurate comparison, but who are you ("you" being generic not specifically *you* Ben) to judge my reference point as a testament to my cinematic vocabulary? What's funny is that the montage as they prepared all the homemade weapons and traps made me think of A-Team! ... but everyone is missing the problem here, Bond decides to go to the castle and prepare for a final match with the enemy and yet he doesn't consider taking every MI5 weapon under the sun (with the help of Q) with him? COME ON? That was such a let down and I can only think they didn't do this because they wanted a silly trap and grab scenario instead which didn't even last very long. In my opinion its much closer to Batman - we find out he's an orphan and his parents dead, he's loaded with an old mansion, and he has a butler of sorts. Clearly someone thought - batmans doing well at the moment what can we sub consciously borrow from that franchise? I think you hit the nail on the head. Home Alone was the first movie I ever saw in theaters, so I couldn't help but think of it first. But that is the difference between "a casusal audience member and al film critic". A film critic has only to know bout something that has ONLY a 100 years. Think about art critics, or literary ones, or even the fahion ones. You need a level of culture if you want to be a critic of whatever would be the theme. As a person who runs a film website (MovieViral.com) and has a Bachelor's Degree in Radio, TV, Film, I have to respectfully disagree. You can't help what you naturally feel. Sure, there are movies that are more closely related to what we see in that scene, but if you have a connection to another film, that's going to trump anything else. I think a lot of people my age, critics included, have a stronger connection to Home Alone than any of those other films. Sorry to disagree, Daniel, but as a film fam I prefer a ctitic with higher standards. Look what I've just found in a comment (not made by a critic) about Skyfall: "My favorite scene was probably the one in the National Gallery, with Ben Whishaw inspiring the comment from Bond, "Brave new world!" Of course the line is from "The Tempest" and is surely meant as a reminder that Whishaw played Ariel, the "tricksy spirit," in Julie Taymor's recent screen version of the same. The full quote is spoken by Miranda to Ferdinand and reads: "How beauteous mankind is! O brave new world, that has such people in it!". Perhaps you don´t like these things, but I found them really more interesting and appealing to read. It depends on everybody's tastes. I like to learn. Your comment has nothing to do with what I said. There is no reason a critic couldn't mention both what you said and that the Skyfall scene reminded him/her of Home Alone. They are two entirely different scenes. Sorry Ben, but as Ive just answered to Daniel, there is (or has to be) the difference between "a casusal audience member and a film critic". A film critic has only to know about something that has ONLY a 100 years. Think about art critics, or literary ones, or even the fahion ones. You need a level of culture if you want to be a critic of whatever would be the theme. So I understand very well Drew McWeenie point: a critic has to write in a higher level than a fan, and so ilustrate his/her audience with examples that can make his readers think in new refferences and try to learn more abot them. skyfall is diffrent from any bond movie no gadgets no hi-tech, just like old days. Why have I not seen any comparisons between a weak villan, in my opinion, who shared many traits with Sean Bean's 006 from Goldeneye, or the lazy plot that is centered around a stolen agent list? Mission: Impossible anyone? That was further reinforced for me with all the train use in the movie. Whether you relate it to Home Alone or Straw Dogs or a western, the fact is that it was taken from somewhere and 4 years should have produced something way more original. It is more ROAD RUNNER than anything written here.